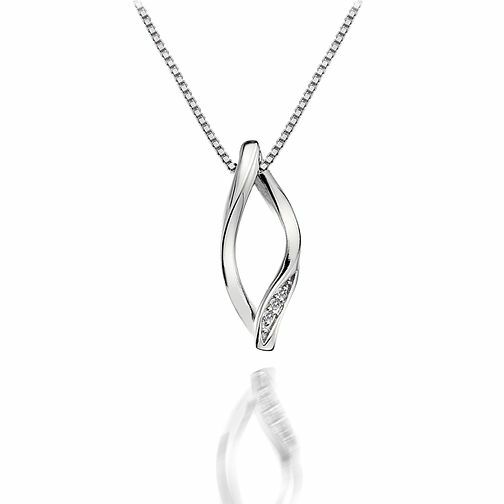 Styled with gorgeous fluid lines, this Hot Diamonds sterling silver open twist pendant is set with a row of sparkling diamonds for a touch of indulgence. Designed for effortless contemporary chic. Hot Diamonds Simply Sparkle Diamond Set Open Twist Pendant is rated 4.4 out of 5 by 5. Rated 2 out of 5 by Anonymous from Beautiful pendant but chain awful This is the second purchase I've made off the H Samuel website which I've had to return because they do not give an accurate description!! Pendant is beautful but the chain has a bizzare feature - a third of the way from the clasp is another hole so you can make shorter which just looks awful. This was mot mentioned anywhere on the website and no photo to show you how it looks. Because where the hole is located, it makes it look like the chain's been repaired. Certainly won't waste my time again online if proper description can't be uploaded.